We expect to receive the layout by November 10. At the same time we intend to make our initial parts orders. Once this is done we are locked into a rigid schedule based on the parts invoicing. Therefore, before we make our parts order (currently anticipated to be November 8) we MUST know the true number of TNCs destined for your site. This means we need a firm order for each TNC. We also need to cover our preliminary costs (board layout will exceed $1300~ for example). For both these reasons we are requesting a $50 non-refundable deposit for each TNC. Checks should be made out to Tucson Amateur , Packet Radio or TAPR. Alternatively, any participant wishing to pre-pay our current estimated cost of $200 may do so with the understanding that no additional cost increases will be passed along to him. (We don't anticipate significant increases, but the exact cost will not be known until we have the final count on TNCs ordered.) The cut-off date for orders is November 7, just before our parts order. Please inform your participants of this important information. As you do so, please bear in mind the following facts concerning Beta Test. First, Beta Test is not a commercial venture. It is, rather, an experiment. For this reason, we ask that each participant ordering TNCs sign the statement below, indicating acceptance of the risks associated with participation in an experimental venture. We cannot adopt a "service what we sell" policy during Beta Test. The Beta Coordinator must ensure that there is an adequate base of technical support locally, to repair and modify the TNCS. This is why we have restricted the test distribution to sites indicating they have the local expertise to handle problems. Beta sites with fewer than four or five members may find it impossible to build a self-supporting group, and would be well advised to find more local support before getting further involved. On the other hand, we will do everything in our power to ensure shipment of functioning TNCS. We take great pride in our work, and intend to have the fewest possible problems during Beta Test. It is our policy that we will give you, the Beta Coordinator, as much support as possible. If you run into a problem you can't handle without our help, please call us or one of the other people in the local group. 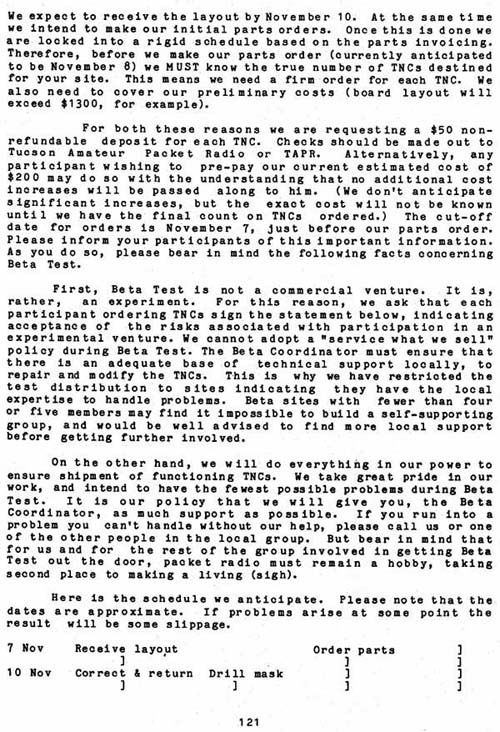 But bear in mind that for us and for the rest of the group involved in getting Beta Test out the door, packet radio must remain a hobby, taking second place to making a living (sigh). Here is the schedule we anticipate. Please note that the dates are approximate. If problems arise at some point the result will be some slippage.